It has been announced that Sayeeda Warsi has been relieved of her post as Chairman of the Conservative Party. The news comes as David Cameron embarks upon a cabinet reshuffle with Ken Clarke anticipated to leave his position as Justice Secretary. Although Warsi's departure is to be welcomed, Cameron's reshuffle will not produce any change in focus or policy that will lead to any significant changes for the better in the country. This is not to say of course that Labour would offer anything better, for clearly, they would not. 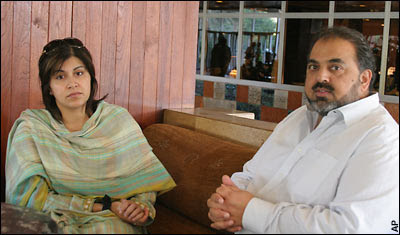 What will Warsi do now? A hint was perhaps provided back in June when she took up the baton on behalf of championing chain-migration into the UK from outside of the EU, using the spurious pretext of familial reunion. This is no surprise, given her background as a specialist in the field of immigration law, and it was suggested here at the time that a return to practice in this sphere might well be her preferred option should her political career hit the buffers. Taking into consideration the current furore connected to the abuse of student status in the university sector as a backdoor route to immigration, defending the 'rights' of bogus students from overseas may exert a certain appeal for her. Who will replace Warsi? Will it be yet another career politician who could quite as readily have sat upon the Labour benches as those of the Conservatives? Whoever it happens to be, the announcement of their appointment is unlikely to cause even a flicker of interest amongst most members of the public. Since writing the above this morning, it has been announced that Warsi has not been removed from a position of influence, but has instead been given two roles: Minister of State at the Foreign Office and Minister for Faith and Communities. Cameron, for whatever reason, evidently did not wish her to be lost to Tory frontline politics. Quite why however, must certainly be a puzzle to many Conservatives as well as to the electorate at large; after all, nobody has elected Warsi: she is a political appointee. As one commenter below has noted, this in itself signifies why reform of the House of Lords is not some empty ephemeral issue, but a matter that deserves to be addressed. There must be an end to the cronyism and political favouritism that has led to the likes of Warsi and Ahmed being given a mandate to influence legislation and government, without being accountable to the electorate. Her appointment as Minister for Faith and Communities is a particular worry. This position may have existed previously, but if so, it slipped under my radar. What is the point of such a post? If we strip away the euphemism, she is now effectively our Minister for Islam and Muslim Communities. Who wants such a position? Not me. Although the Monarch is the Head of the Church of England, we need a secular state that guarantees our freedom from religion, not a state that actively protects and promotes some of the most backward beliefs known to humanity. Religion and the state should be kept strictly separate. used a visit to the Vatican to condemn secularism, likening its advocates to supporters of totalitarianism, having previously declared that the Coalition was a government that would "Do God"
She may play at being a "progressive Muslim", but her Vatican statement and general stance betray her intolerance for freedom of thought and freedom of conscience, employing her minority 'victim' status as a means of forwarding a deeply retrograde anti-Western anti-rationalism. Her presence in the current Government does no credit to the British political system, and is of an entirely negative nature; she has to go. The question is: when and how? the only way to get a change of focus in this country will be to vote for any one other than the vested-interest-three, our nearly elected UN representatives. that, sadly, is down to our voters who are in thrall to the media with its drip feed of painkillers in the form of football, soap operas and "reality" shows. Well, hopefully when a viable alternative choice is placed before people, they will avail themselves of the opportunity of voting for it. I'm also pleased to see Warsi gone from the co chair position but she should have gone properly not been shuffled off to a job where she can continue to screw up. I agree, but given what has happened I am afraid to say that we could well be seeing much more of her in different roles in the future. Unfortunately UK politics is infested by these sleazy chancers. Opportunist does not even begin to describe them. Warsi is a political spiv who should never be allowed anywhere near public office and the payment it brings. Bliar, Scameron. This is what the political system has become. Unprincipled Charlatans. I have been told that there is some very good material on Warsi and her careerist political aspirations in 'The Islamic Republic of Dewsbury', but I have yet to read it. If there is more on this rascal then go for it Duro. I agree that Warsi has some views that are extremely problematic to us, but her prominent position sends a message to the victims of the "standard model" of Islam in the UK that puts abusive men in positions of power. Cameron's an idiot of course, but at least he appears to see the power of the message sent by retaining a Muslim woman who has many points of conflict with traditional Islam. That's true Joe; it would have been worse if Cameron had chosen a Muslim male for accelerated promotion to office. 'The Islamic Republic of Dewsbury' ISBN 978-0-9570964-0-0 has a lot of interesting material on Warsi's early years in politics. I have read the book and written a review of it - I may be able to let you have a copy in a few weeks for this blog. Warsi was using and abusing people even in her early years in politics, the book's author, Danny Lockwood (a local newspaper owner) admits to being duped by her. Joe Daniels says 'he appears to see the power of the message sent by retaining a Muslim woman who has many points of conflict with traditional Islam.' I must disagree with Joe who appears to have a simplistic view of Islam as a society which is male dominated. As an example take Pakistan which implements a hardline version of Islam in politics and law. Just one example of that hardline society is the recent furore where a young girl with Down's syndrome was threatened with the death penalty for 'blasphemy' for allegedly burnings pages from the Koran. (Turns out now that she was set up by a local Iman who tore pages from the Koran and put them into a bag of torn paper the girl was carrying - the Iman has now been arrested !). Yet in this same society allegedly hostile to women one of the most famous politicians was the late Benazir Bhutto. Labour also tried to promote Muslim women into the House of Lords so this is not a unique idea of Cameron's - Cameron does not do original ideas ! Labour's promotions included Baroness Udine who became (in)famous for claiming expenses for a flat she never occupied. Thank you Ivan. That would be much appreciated. The case involving the young girl with Down's Syndrome is dreadful. Of course, the very idea that 'blasphemy' can be a crime is insane enough, but the persecution of this child represents a particularly repellent example of the application of this Pakistani law. What else is the British Government up to as well as supporting Muslim extremists against their own people? Read these and weep! Thanks for the links. I'll take a look when I have time. Another dodgy character Scameron aka Call Me Dave aka Posh Boy aka Mr Slippery has promoted is our old friend, parliamentary expenses fraudster, David Laws. He is back in the Coalition fold as a Department of Education Minister. Wealthy investment banker Laws trousered £60,000 of public money in a sustained four year fiddle. The thief was not charged whilst other sleazy MP fraudsters who stole lesser amounts were jailed. For certain this once again shows up the contempt to which the political elite hold us in. Yes, I noticed that he was back in. What a banker, eh?